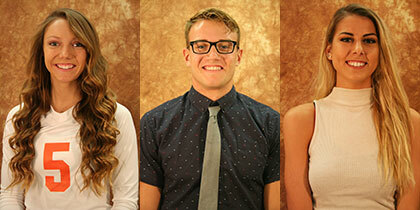 With the fall sports season underway, Cowley College announced the first Athletes of the Month of the 2016-2017 school year. The September Male Athlete of the Month is sophomore track and field athlete Mace Metcalf. Sophomore volleyball outside hitter Olivia Powell and sophomore cross country/track runner Courtney Griffiths were named Co-September Female Athletes of the Month. Metcalf was chosen the Male Field Event Athlete of the meet after winning the decathlon and placing fourth in the pole vault at the Region VI/Jayhawk Conference Outdoor Championships held in May. He also competed and scored in the conference in the high jump and 110-meter hurdles. He is majoring in athletic training and has a grade point average of 3.35. Griffiths was chosen as the Female Track Athlete of the meet after winning the 800-meter run and 1,500-meter run at the Region VI/Jayhawk Conference Outdoor Championships held in May. She is currently running as part of the No. 6-ranked Lady Tiger cross country team. She is majoring in business administration and has a grade point average of 3.93. Powell leads the No. 16-ranked Lady Tiger volleyball team in kills (158), while adding 154 digs and 13 aces through the team’s first 11 matches. At Cowley, she is a Student Ambassador, Cowley Tutor, and is majoring in Athletic Training. She is majoring in athletic training and has a grade point average of 3.38. The Athlete of the Month award is sponsored by Reedy Ford in Arkansas City.